There is a time of the day that is slowly becoming more and more difficult for me. Naptime. This is not your normal “toddler resisting nap” story. This is the story of one woman, six toddlers and some new challenges. In the past I have always been somewhat proud of my ability to gently calm a group of toddlers to sleep and keep them asleep for 2+ hours. That was before my son was in the mix. Now most days I struggle to get him down around noon when the others sleep and am lucky if he gets a good hour and a half sleep. This struggle is two fold. 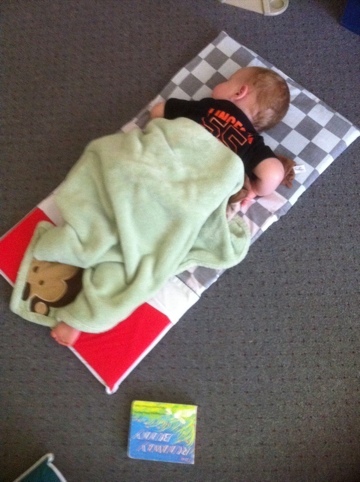 My boy is a great sleeper at home. Through gentle sleep techniques we have helped guide him to a place where he puts himself to sleep and sleeps comfortably. We read books, give cuddles and say night night. He talks himself to sleep most days saying good night to the experiences and people he has come in contact with through the day. School days consist of a totally different routine. It is eat, lay down on your mat, go to sleep. For a child who hasn’t slept while out ‘n about since about four months this is a most difficult task! It is quite a struggle for me to stay calm and consistent with the message that it’s time to lay down, calm our body, rest our voice. I also feel an internal struggle as I pat his back everyday. I love that he knows his body so well and is able to get himself comfortable, I hate feeling like I am interfering in this process. Somedays (like today) he needs more help to calm his body down and that means I take some of this control away from him. I also know he would love more of a calming routine prior to nap but how can I fairly read to him while telling others to lie down? Personally I couldn’t sleep in a room full of light and exciting toys so I am empathetic to the difficulty he has. In a perfect world we would have more control of our napping situation. Join in the Emerging discussion!